Commercial traffic and shipping take place by land and sea. One lane of traffic sea bypassed India-China is the Strait Malak. Indonesia is located in the path of the position of the cross two continents and two oceans, as well as being near the Strait of Malacca into serine visited by foreign nations such as India and Persia. The emergence of traders from other countries to make the existing port in Indonesia to be crowded and increased economic activity. The alien influence entry into the country, one of which is a Hindu-Buddhist. The involvement of the Indonesian nation in international trade and shipping activities causing the mixing of cultures. 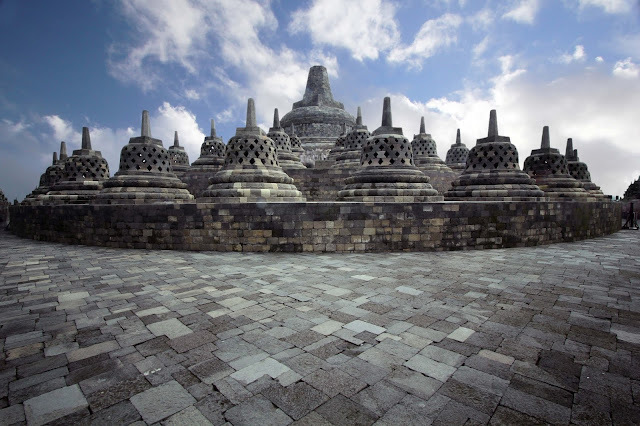 India is the first country to give effect to Indonesia, namely in the form of Hindu-Buddhist culture. The results of the public culture of Indonesia during the Hindu-Buddha various forms, there is a form of the building (the temple), sculpture (statues), sculpture and carving (relief), as well as literature (books) and traditions. 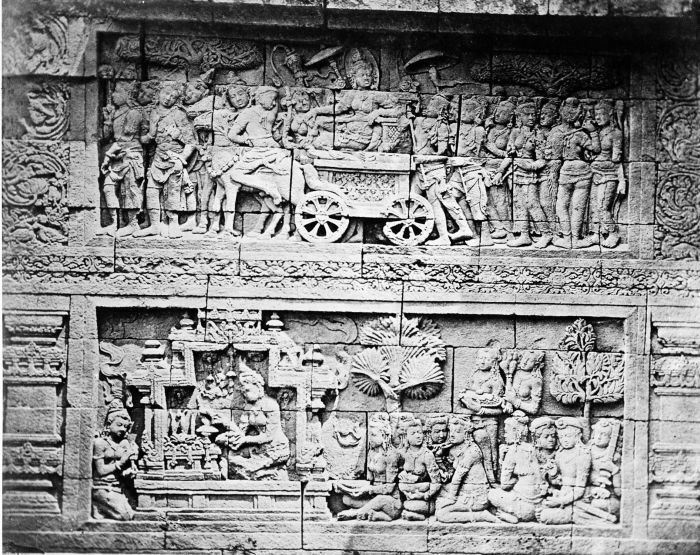 The results of the public culture of Indonesia during the Hindu-Buddha various forms, there is a form of the building (the temple), sculpture (statues), sculpture and carving (relief), as well as literature (books) and traditions. The temple is generally shaped high building with three parts. The lower part is a symbol bhurloka (human nature), the center illustrates bhuvarloka (natural death), and part of the roof symbolizes swarloka (realm of the gods). The temples in Indonesia has a different complexion. The temples in North Central Java usually circular, in which small temples encircling the main temple were great. It describes the structure of society that puts the king as the center of power. This is understandable, given the kingdoms in the northern part of Central Java is generally a Hindu kingdom. The temples in the southern part of Central Java generally have the same size, no great temples and taller than the other. It describes the composition of a democratic society that puts the king and other similar communities. This is a character who does not adhere to Buddhism caste system. The temples in East Java usually put a large main temple behind the temples are smaller. This illustrates the position of the king as a unifying community. 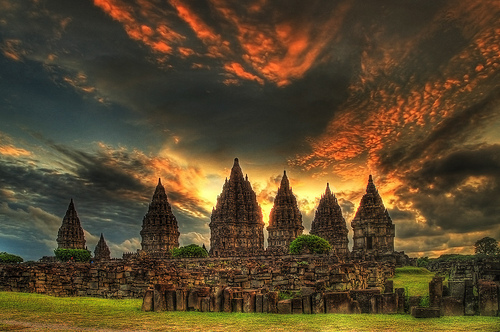 The temple is not only found on the island of Java, but are also found in other islands. For example, Barelang temple located in Sumatra. Candi Dieng (Central Java, Mataram Lama). yupa / inscription is a stone monument that serves as a memorial. Yupa / Inscription using Pallawa or Sanskrit and a major source for the experts in interpreting the history of the kingdoms in the Hindu-Buddha. Kalasan inscription from the year 778 AD. Middle Reef Inscription to the year 824 AD. Argapura inscription from the year 863 AD. 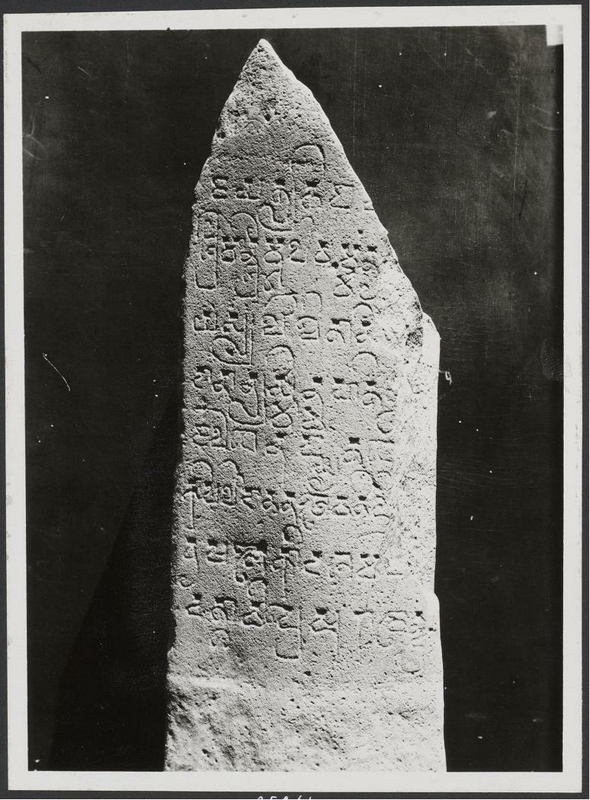 Three inscriptions from the reign of Jayanegara namely Inscription Tuhanaru (year 1322), Blambangan Inscription, Inscription Blitar (1324). Statue is a stone carved to form a human or animal. Typically, created to illustrate people or certain gods. Several statues of Hindu-Buddhist culture results include a statue of Shiva, Brahma, Vishnu, Buddha, and Dhyani Bodhisattva. Ngaben, a cremation ceremony in the Hindu community in Bali. Cremation ceremony intended to restore man to his home. Nyepi is the Hindu community religious ceremonies. Nyepi has a goal to make amends and introspection on the behavior that has been done a year ago. Nyepi is done by sitting at home without carrying out any activities in accordance with the rules in Nyepi ceremony. Nyepi done to commemorate the new year Saka. Galungan is the feast day Hindu Dharma conducted once every 210 days, falling on Wednesday POND, twice in one year. Brass is the feast day Hindu Dharma conducted two weeks after the day of Galungan. Sadranan carried out by the Hindu community by bringing offerings graves or shrines. Kesodo a ceremony performed by a Hindu community in Tengger, East Java. Kesodo a ceremony of offering offerings into the crater of Mount Bromo. 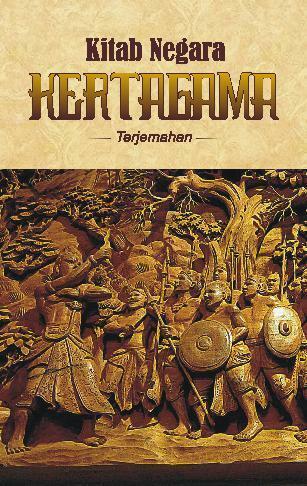 Results of culture in Indonesian society at the Hindu - Buddhist sanagta various forms, such as the shape of magnificent buildings (the temple), sculpture sculpture (statues), sculpture and carving on the stone wall (relief), as well as forms of literature (books) and traditions. The temple usually in the form of a building which is quite high with three (3) parts. The bottom is the epitome of bhurloka meaning of human nature, in the middle symbolizes bhuvarloka natural means death, and on the roof describe swarloka natural meaning of the gods. Book and literary works. Hindu and Buddhist past left some books whose contents vary. There containing stories, news history, or tales. Relief is carved texts or images that are usually found on the temple walls. Some relief is no life experiences that tell the king and the Hindu gods or Buddha. 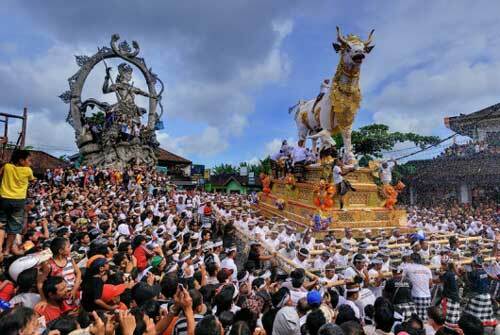 Traditions or habits such as cremation, Nyepi, Galungan, Kuningan, Sadranan and Kesodo. 0 Response to "This Results from The Tradition on Hindhu-Buddhist Kingdom in Indonesia and Remains up till now"